Growing and maintaining indoor plants and growing healthy, vibrant flowers without the right soil chemistry can be like expecting miracles. Good soil is one of the cornerstones of successful house plants and gardening, plus it is important to make sure that your soil will meet the needs of your plants before the first seed is planted. While soil chemistry is important no matter what type of plants or flowers you’re growing, it is particularly critical when it comes to bulbs, perennials or other plants that remain in the ground for than one season. Why? The chemistry of soil can change from year to year. So, if a formerly great blooming patch of a garden or houseplants are looking a bit haggard, the first place to expect is at the condition of the soil and roots. Erosion, overuse of pesticides and fertilizers plus other factors can impact the quality of the soil, so it is important to test the soil if you suspect a problem. 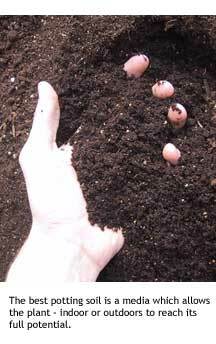 Garden soil should be tested anytime a new flower bed is prepared. It’s a mistake to assume that the soil make up and chemistry is the same everywhere on your property. Since the makeup of different patches of soil can be very different, due to past use, drainage, chemicals or residue in the ground, etc. Do a thorough soil analysis prior to planting a bed of flowers. Most major cities have several laboratories that can do soil testing. You can also check your agricultual extension for testing. Be sure to contact such a lab to have the soil analyzed for pH level, and for levels of important plant nutrients. If you are unsure where to get the soil tested, be sure to ask the staff at your local nursery or garden center for a recommendation. After you know the current condition of the soil, you’ll be in a better position to know how to amend and make the changes to the soil that are needed. Once you know the pH level, the level of organic material in the soil, the amount of clay, amount of sand, etc., you will be able to choose the right additives to provide your plants with what they need to thrive. Most varieties of annuals, perennials and bulbs will grow well in a wide range of soil pH, but some plants have specific needs, and prefer soils that are either very alkaline or very acidic. The pH level of the soil can be a particularly critical factor when deciding what types of plants will work best. If your pH range is outside the norm, or if it needs to be amended, there are a number of ways to accomplish this goal. For example, limestone can be used to make acidic soil more alkaline, while sulfur is often used to make very alkaline soil more acidic. A pH level that is out of balance can also be helped by adding humus. This rich soil can be created at home by using a compost bin, or it can be purchased ready made from a garden center or nursery. Changing the pH is a big factor when your fertilizing indoor house plants and not leaching out the soluble salts. After you know the baseline content of your flower bed, it will be easier to track chemistry changes from year to year, and to make amendments as needed. The more you know about the quality of your soil, the more confident you can be that the plants you buy will thrive in your home garden. Plant Watering – Thorough is Good!